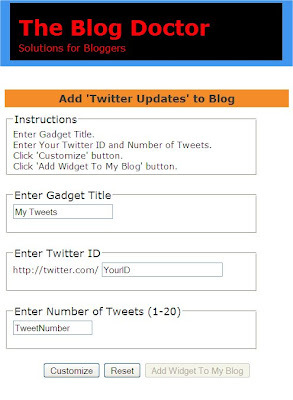 Add Twitter to Blog in 4 Clicks. ~ The Blog Doctor. You are here: Home > Widget > Add Twitter to Blog in 4 Clicks. 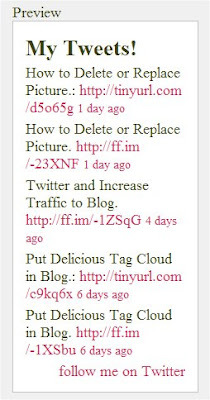 Add Twitter to Blog in 4 Clicks. Now that we have started micro blogging with Twitter.com we would like to show off our Tweets on our blog. This helps in setting up a conduit between your blog and your Twitter. Visitors to your blog may get impressed enough with your tweets and start following you on Twitter also. See picture at left. SECOND CLICK : Fill in your Twitter Username instead of 'YourID' , customize title as you like instead of 'My Tweets' and type in the number of tweets you want shown instead of 'TweetNumber'. Then click Customize button. FOURTH CLICK : In the Add Page Element window select the blog you wish to add the gadget to (if you have multiple blogs in one account). Then type in a title "My Tweets" for the gadget. Lastly click 'Add Widget' button. 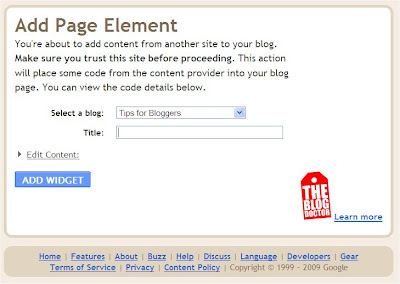 The Page Elements subtab of Layout tab will open with the message that the widget has been added to the blog. You can use this installer to add anyone else's tweets also. Just fill their Username instead of yours. The twitter gadget will adapt the styling of your blog. Enjoy! Is there a problem with this widget application at the moment? I keep trying to install it but when I get to the Choose Your Blog drop-down box, the box remains blank, even though I'm logged in. Try clearing the cache. When logging in check the Remember Me box. I don't know if anyone has told you that they are having a problem with posting a comment, but if you haven't heard this before, I had this problem posting a comment today when I tried to comment it asked for word verification but it doesn't let you scroll down to it. To fix this on my blog, I disabled the word verification. But then I decided to just add the comment luv widget to my blogs. I think this happens a lot to people with custom templates on Blogger.com. I really like your blog. You have some great tips for your readers. I have a couple of blogs - i-Blogger.info and hcg411.info - i-blogger is the kind of the same topic/niche as your blog here. If you would like to do a project or joint venture together sometime, let me know. My personal email is brianco1@hotmail.com check out my blogs and let me know if your interested.